Albert Kraemer (1889 - 1953), born in Frankfurt am Main, lived from 1937 to 1943 in Berlin. At first he studied at the local Frankfurter Kunstgewerbeschule, and later at the Akademie für Bildende Künste in Berlin. 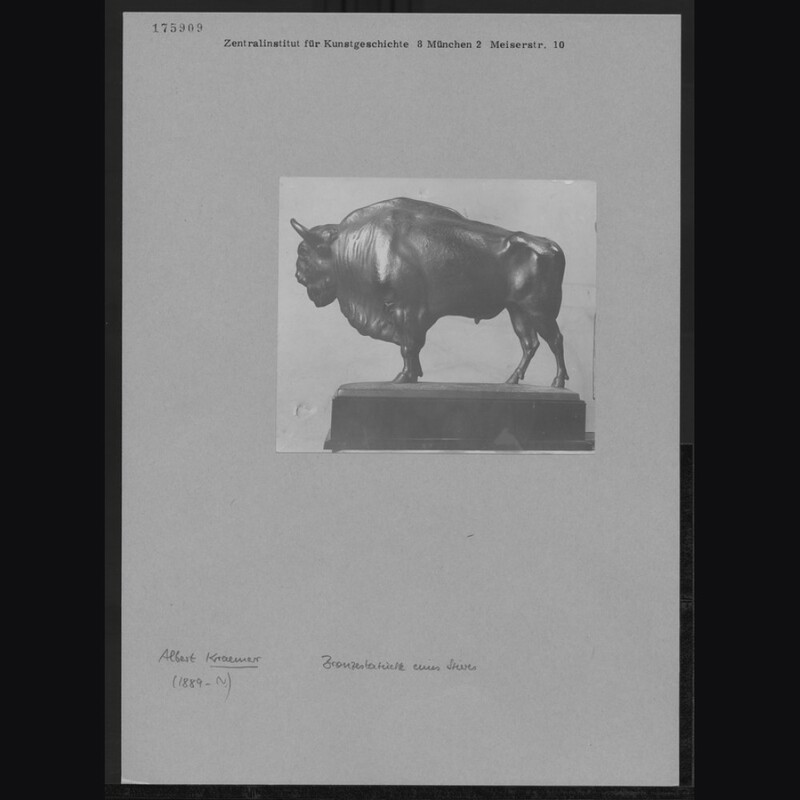 He made portrait busts, war monuments and, especially, animal sculptures. Kraemer was influenced by August Gaul. His direct and formal style of sculpturing animals is reminiscent of French sculptures from the early 20th century. The city of Berlin is in possession of some of his sculptures. He created the sculpture at the grave of Leutnant Emmrich, a volunteer soldier and son of an industrialist in 1918 (located at the graveyard Parkfriedhof Lichterfelde, BeAlbert Kraemer (1889 - 1953), born in Frankfurt am Main, lived from 1937 to 1943 in Berlin. At first he studied at the local Frankfurter Kunstgewerbeschule, and later at the Akademie für Bildende Künste in Berlin. He made portrait busts, war monuments and, especially, animal sculptures. Kraemer was influenced by August Gaul. His direct and formal style of sculpturing animals is reminiscent of French sculptures from the early 20th century. The city of Berlin is in possession of some of his sculptures. He created the sculpture at the grave of Leutnant Emmrich, a volunteer soldier and son of an industrialist in 1918 (located at the graveyard Parkfriedhof Lichterfelde, Berlin). Kraemer, against tradition, did not create an ideal model of the heroic individual, but instead showed a young, sportsmanlike human being in classic nakedness. Later, a copy of this sculpture was displayed at the Great Art Exhibition in 1940 as 'Modell für ein Kriegergrabdenkmal'. Around 1920 Kraemer designed -in co-operation with Hugo Lederer- several terracotta figures for the facade of the building of the former ‘Reichsschuldenverwaltung’ in the Oranienstraße 106, Berlin (because of the broad facade, the building was nicknamed ‘laying scyscraper’). He was represented several times at the ‘Grosse Berliner Kunstausstellungen’ and at exhibitions of the ‘Preussische Akademie der Künste'. In 1936, close before the Olympic Games, Kraemer created two bear sculptures for the bridge ('Torbrücke') of the newly constructed German Autobahn A9, the last bridge before the Berliner Ring (just before Autobahndreieck Potsdam). 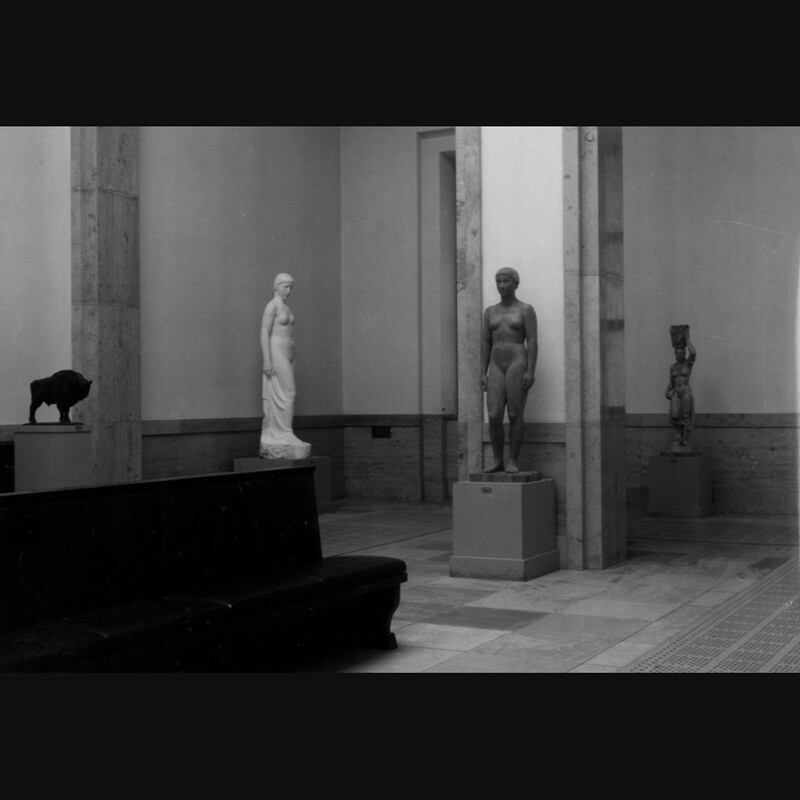 Albert Kraemer had 11 sculptures displayed in the Great German Art Exhibitions. Besides the ‘Kriegergrabdenkmal’, there were the following: ‘Wisentstier’, ‘Pelikangruppe’, ‘Panthergruppe’, ‘Bär’, ‘Grosse Pelikan Gruppe’, ‘Liegende Panther’ and ‘Panther am Baum’. Two bears (stone) by Albert Kraemer can still be found at Berlin-Tempelhof, Mariendorfer Damm 115, in the garden of a children day care centre.rlin). Kraemer, against tradition, did not create an ideal model of the heroic individual, but instead showed a young, sportsmanlike human being in classic nakedness. Later, a copy of this sculpture was displayed at the Great Art Exhibition in 1940 as 'Modell für ein Kriegergrabdenkmal'. Around 1920 Kraemer designed -in co-operation with Hugo Lederer- several terracotta figures for the facade of the building of the former ‘Reichsschuldenverwaltung’ in the Oranienstraße 106, Berlin (because of the broad facade, the building was nicknamed ‘laying scyscraper’).